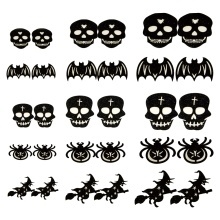 Halloween decorative stickers kit, 30 stickers in 5 pattens in total. Wonderful decorations for Halloween and any spooky themed parties! Self-adhesive glitter stickers kit, perfect Halloween props. 5 sheets of stickers(30pcs)in total: each sheet has 6pcs stickers in 3 sizes. 5 different patterns including skull, bat, witch and spider. Great decorations for tea candle lights, wine glass, windows, walls, cups, gift boxes, etc. Note: The stickers only, other items are not included.